Verifiable information on the history of Greenlawn Cemetery (also known as the City Cemetery and Union Cemetery) is rather sparse. Once located on Kentucky Avenue at the present site of the Diamond Chain Company, there is no trace of the cemetery today. 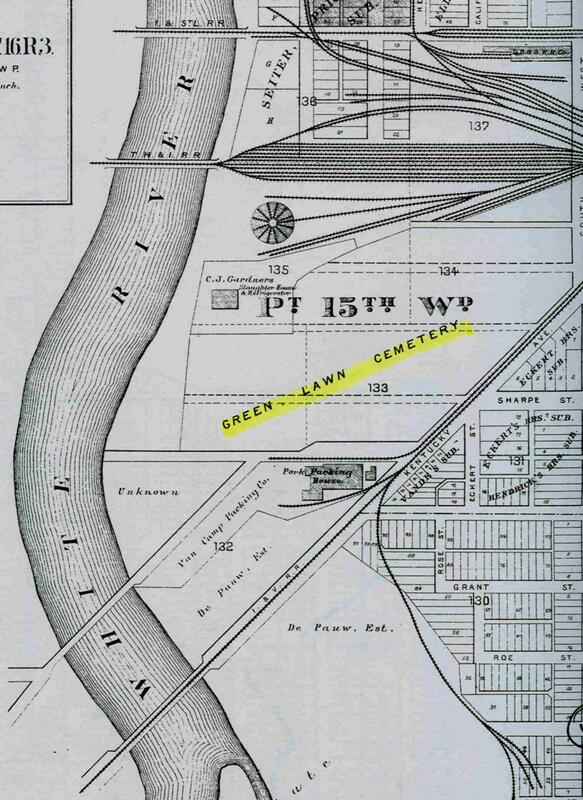 An Indianapolis 1876 map refers to the cemetery as "Greenlawn" and shows it was bounded by South West Street to the east, White River to the west, the St. Louis & Vandalia rail line to the north and River Street to the south. "Indianapolis, a Historical and Statistical Sketch of the Railroad City, a Chronicle of Its Social, Municipal, Commercial and Manufacturing Progress, with Full Statistical Tables" (W. R. Holloway - 1870), gives a brief history of what are termed the "old graveyard" and the "new graveyard". The publication also mentions the "Union Cemetery", a five acre plot laid out in 1834. By 1844, the "old graveyard" was deemed too small and several subsequent additions (the "new graveyard") were made. According to the publication, the entire 25 acre site was then collectively called "The City Cemetery". According to the “Encyclopedia of Indianapolis” (David J. Bodenhamer - 1994), the first public cemetery in Indianapolis was established in 1821. Called the “City Cemetery”, it was located on Kentucky Avenue near the White River. In 1834, Union Cemetery was established on the eastern border of the City Cemetery and, in about 1838, the eight acre Greenlawn addition was made. In 1852, the City Cemetery reached its final 25 acre size with the addition of another seven acres. By the 1870s, the City/Union/Greenlawn Cemetery was more commonly as referred to as Greenlawn. With the 1864 opening of Crown Hill, Greenlawn fell into disuse, though it appears that there were still burials there until its closing in 1890. By that year, many of the earlier burials (including many notables in the early Indianapolis history) had already been moved to Crown Hill, Floral Park, and Holy Cross Cemeteries by their family members. Reportedly in 1920, “E.H.K McComb” identified as the principal of Manual High School, made an accurate listing of the grave markers still in Greenlawn. (It appears that this cemetery reading was actually done by Joseph Moore, one of the instructors at Manual HS.) Reportedly the (on-site) burial records were destroyed by a fire around 1866. No individual sources were cited by either publication. During the Civil War, approximately 1,300 Union soldiers and 1,600 Confederate soldiers were buried in the City Cemetery. The Confederates were prisoners of war who had died while being held at Camp Morton. (For more information about Camp Morton and the Confederate burials, see this internet article about Camp Morton.) Beginning in 1866, the Union burials at Greenlawn were moved to the Crown Hill National Cemetery (contained within Crown Hill). Between 1928 and October 1931, the remains of the 1616 Confederate prisoners were moved to the Confederate Mound also in Crown Hill. SHAARD shows a listing for Greenlawn Cemetery (#CR-49-06), but not for City or Union Cemetery. The cemetery locator on the Indiana State Library web site, shows Greenlawn and City as the same cemetery, but has no entry for Union Cemetery. Ron Darrah compiled a burial list which was published in the Fall 2004 issue of Family Quest. This information came from various sources and is not a complete burial list. The GSMC also published Ron's list and additional information in "Burial List and History of Greenlawn Cemetery" in 2008. The first 17 pages of our Greenlawn burial list came from the 2008 publication. The last two pages show names which were found/submitted after the 2008 publication. A complete copy of this publication is available in our Members' Only section. This is the site of Greenlawn Cemetery as it is shown on Page 50 of the 1889 Indianapolis- Marion County Atlas by Griffing, Gordon & Company.